LANESVILLE—Sometimes it takes the perspective of a newcomer to prompt a change that, in retrospect, is a joyful complement to both the Church family and its broader civic community. 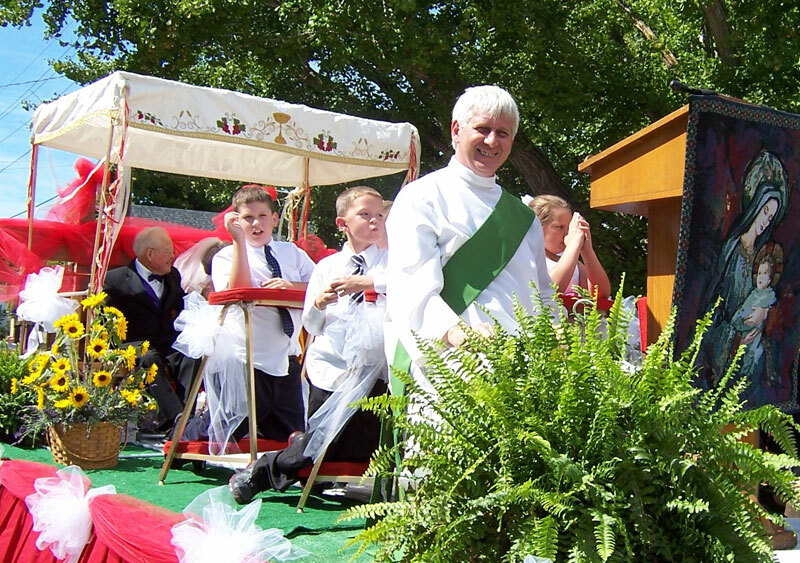 When Father Juan Jose Valdes of Guadalajara, Mexico, was assigned as administrator of St. Mary Parish in Lanesville in 2010, he found himself immersed in a rural, close-knit parish with strong German roots. Raised in a farming community in Mexico, he had much in common with residents although the methods used to work the earth in each region are vastly different. The priest eagerly attended Lanesville’s Heritage Weekend festival, which highlights the town’s rich history, notably by demonstrating antique implements used by early settlers. But as he watched the festival’s parade, he was surprised that St. Mary Parish did not have a float among those with a religious theme. Spurred by this omission, he suggested that parishioners enter a float in this year’s parade. The parish’s arts and environment committee took on the challenge with the same cheerful, can-do attitude and collaborative effort that is their signature approach to creating a beautiful worship space every week. Talented members produced a design in accordance with this year’s parade theme of “Past, Present and Future.” Their vision came to fruition as Jerry and Lennie Reinhardt hosted a float-building party at their family farm. On Sept. 15, sunshine and pleasant temperatures drew a record crowd to Lanesville for the parade and festivities. Drawn by a mule team furnished and driven by Scott Berkeley, St. Mary’s float featured a tapestry of the Madonna cradling the infant Jesus, depicting one of the foundational beliefs of the Catholic faith. A wooden ambo highlighted the centrality of the proclamation of the Word of God. Recently ordained permanent Deacon Rick Cooper, dressed in an alb and stole, and his wife, Diane, symbolized the present Church. Cierwen Abell, Marisa Elder, Madison Hubbard, Ethan Hublar, Brent Kendall and Jared Willoughby, who received their first Communion in April, knelt on kneelers in the center of the float to signify the Church’s future. The design focused on the sacraments of first Communion, matrimony and holy orders, and emphasized vocations to be discerned by youths or embraced and carried out by adults. The float and its riders presented a joyful and inviting snapshot of the theology of the Church, both basic and complex. Only God knows how this foray into a new evangelization will bear fruit, but cheerful obedience to a pastor’s idea has already demonstrated that evangelization can be fun. Stretching beyond the realm of the familiar brought generations together, promoted the parish within the larger community in a new and different way, and broadened the horizons of those involved in creating the parade entry.